Israeli Prime Minister Ariel Sharon has called on the United Nations to expel Iran after its president called for the Jewish state to be "wiped off the map". "A country calling for the destruction of another people cannot be a member of the UN," Mr Sharon said. Mahmoud Ahmadinejad's comment has been condemned by Western states and Russia, which suggested it would deepen the row over Iran's nuclear ambitions. Iran later accused the West of turning a blind eye to Israeli "crimes". A statement from the Iranian foreign ministry did not specifically mention Mr Ahmadinejad's speech but it reacted by saying Iran's embassies in the West would officially protest against Europe's attitude to "Zionist crimes". Iran, the statement said, blamed the complex situation in the Middle East on continued support for Israel. There was no sense, the BBC's Frances Harrison reports from Tehran, of Iran backing down from the fierce anti-Israeli remarks of its president. Indeed, our correspondent adds, a commentary on Iranian radio said there was nothing new about what Mr Ahmadinejad had said. It complained that the West had overreacted because it wanted to smear Iran's image and to convince public opinion abroad that Teheran was seeking a nuclear weapon - something Iran has always denied. Mr Sharon issued his call for Iran's ejection from the UN after meeting Russian Foreign Minister Sergei Lavrov on Thursday. Mr Sharon suggested that if Iran acquired nuclear weapons it would threaten "not only Israel and the Middle East but also Europe". 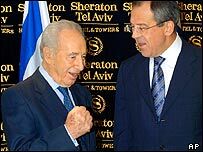 Mr Lavrov, whose country has been supplying civilian nuclear know-how to Iran, said earlier in Jordan that the Iranian remark had been "unacceptable". "Those who insist on transferring the Iranian nuclear dossier to the UN Security Council have received an additional argument for doing so," he added. The White House said the Iranian remark showed the US was right to be concerned about Iran's nuclear programme. EU leaders meeting in London issued a joint condemnation "in the strongest terms" following statements of concern from individual members of the 25-state body. "Calls for violence, and for the destruction of any state, are manifestly inconsistent with any claim to be a mature and responsible member of the international community," the statement said. 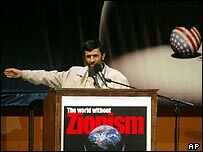 Mr Ahmadinejad told some 3,000 students in Tehran that Israel's establishment had been a move by the West against the Islamic world. He was addressing a conference entitled The World without Zionism and his comments were reported by the Iranian state news agency Irna. "As the Imam said, Israel must be wiped off the map," he said, referring to Iran's late revolutionary leader, Ayatollah Ruhollah Khomeini. In 2001, former Iranian president Hashemi Rafsanjani called for a Muslim state to annihilate Israel with a nuclear strike. Such calls are regular slogans at anti-Israeli or anti-US rallies in Iran. Mr Ahmadinejad warned leaders of Muslim nations who recognised the state of Israel that they faced "the wrath of their own people". Mr Ahmadinejad came to power earlier this year, replacing Mohammad Khatami who had sought better relations with the West.